Just prior to being exposed for quietly using the questionable practice of "bid-caching," digital ad exchange Index Exchange had been trending upward in all of the quality score and trust ratings compiled by independent assessment firm Pixalate. 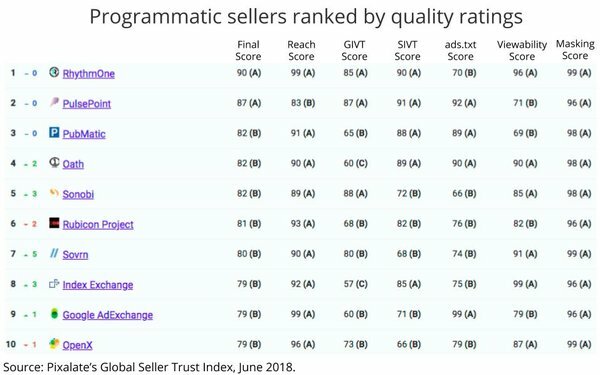 Its June 2018 Global Seller Trust Index, which was published just prior to the bid-caching news breaking in August, shows Index Exchange moving up three positions to rank as the eighth most trustworthy digital ad exchange. The ranking is a composite of key quality indicators -- including each exchange's reach, ads.txt, masking, invalid traffic and ad viewability. It will be interesting to see how Pixalate's August Trust Index reflects news about Index Exchange's use of bid-caching and the backlash that followed it.